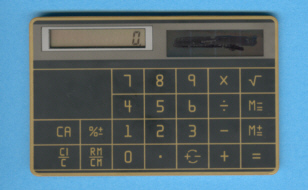 Size: 2.1" x 3.4" x 0.10"
Canon introduced in 1984 with the LS-704 a typical credit card sized calculator using solar cells instead the batteries. The LS-704 was available in either a grey or white color scheme. Unfortunately the design is as plain as the keyboard, don't miss the exciting Palmtronic LC-7.